This book strictly covers ‘word to word’ syllabus by Central Council of Indian Medicine for BAMS course. Each topic in this book is elaborated in simple English with references from compendia. Learning objective are given in the beginning of each chapter whereas ‘additional comments’, which are useful for PG course in this subjects as well for scholar and enthusiastic learners are provided at the end of chapter. Author of this book, Prof. Dr. Nandini Dilip Dhargalkar is awarded Sharadini Dahanukar Beast Teacher Award in June 2006. She is seniormost faculty in this subject teaching for twenty-six years. She is examiner, paper setter for Pune University, Rajiv Gandhi University of Heath Science, Karnataka; Maharashtra Universality of Health Sciences, Nashik. Honourable CCIM president Dr. Mr. Shriram Sharma, in this foreword commented on this book as the best book for Ayurvediya Sharira-Kriya. The book is enriched with modern physiology as and when required. Extra references have been added for wide reading to achieve deep Knowledge of the subject. Latest researches have been considered while offering additional comments. This book will suffice and satisfy both teachers of this subject and students of undergraduate as well as post graduate courses. Previous volume of Sarira Kriya Vidnana got roaring response from all institutes. Thanks a million for this showering love and respect. It was inaugurated by honourable Vice-chancellor Dr. Narendra jadhava, Pune University, (to the left) and honourable Vice-chancellor Dr. Mrudula Phadke, Maharashtra University of Health Science Nashik (to the right). This elaborative Sarira Kriya Vidnana book converse every point of CCIM Syllabus in undergraduate as well as postgraduate course. Rich is reference, written in transliteration style, this text makes understanding of Ayurvedic student crystal clear about fundamentals. Roganidana and chikitsa is incomplete without a capable ‘Dosha-dhatau-mala’ expert. While this volume was under print, CCIM syllabus showed signs of change in module. Perceiving this, supplementary small book as part of this book will be published in month. Regrates for this inconvenience. It has been a great pleasure for me to write a few words as preface to the book Sharir Kriya Vigyan written by Prof. Dr. (Mrs.) Nandini Dilip Dhargalkar. Prof. Dr. (Mrs.) Nandini Dilip Dhargalkar is a well experienced teacher and re-nowned scholar of Ayurved. The book Sharir Kriya Vigyan written by her is a best book of the subject containing all ayurvedic topics of the subject with necessary topics from the modern medicine, as per syllabus of the subject, prescribed by C.C.I.M. for Ayurvedacharya B.A.M.S. course. The book is written in English translating the Sanskrit words in English. It is not a easy task to find exact synonym of technical English words in Sanskit. The author has put very easy and proper synonyms to translate the Sanskrit word which is comprehensive and easily understandable. Sharir is an object made with Five Mahabootas i.e. Space, Air, Fire, Water, Earth. All objects including human beings in the Universe are made of these Mahabhootas. These objects are classified in two categories 1. organic 2. Inorganic When the soul is united with the object then it is called organic and when it is without soul it is called inorganic e. The human body without soul is called is described as dead body, when it is with the sour is called or living body. All the normal and abnormal function or activities, take place in the living body. As charak says Kriya means the functions or activities of the living body. Here the word Kriya is also described for clinical activities including the various functions performed by the Vaidya while treating a patient. Hence, it is necessary that a student of Ayurved must know extensively all the functions incurring in the human body and activities of Vaidyas with their resulting functions for keeping or making this purush healthy. Acharya charka says about the importance of study of subject Sharir. In ancient texts of ayurved Charak Samhita, Sushrut Samhita etc. is said that all beings of the world are made by collective or combined five mahabhootas. Active form of these bhootas in the living body are doshas, Vata, Pitta, Kaph. Ultimately the Sharir is made of these three doshas. Since doshas are active factors of living body which need base for their activities which are called as dhatus and resulting products are malas. As our Acharyas say “This means the body is congregation of three doshas”. In Ayurved Anatomy and physiology both subjects are clubbed in In the syllabus of Ayurvedacharya BAMS degree course of Ayurved, prescribed by CCIM, Sharir is an important subject among other subjects. In Ayurvedic Samhitas like charak and Sushrut the Subject Rachana sharir and Kriya sharir is described as in the same chapters of the Sharir Sthan. But in the 19ft Century, since subjectwise teaching is started, the subject is divided into two separate subjects 1. Rachana Sharir or sharir Rachana (Anatomy) and. 2.Kriya Sharir or Sharir Kriya (Physiology) The book Sharir Kriya Vigyan written by Prof. Dr. Dhargalkar including almost all the topics of syllabus is a comprehensive book to understand the subject properly and easily. The subject Sharir Kriya Vigyan or Kriya Sharir is the most important subject of syllabus of the Undergraduate and Post graduate courses of Ayurved. Extensive study of theory and practicals of this subject is very necessary for student of Ayurved, since the duty of a Vaidya or physician is to Keep is healthy person ever healthy and cure the disease of an ill person. All the actions/activities of a Vaidya are to keep the body intact in all the times. In Ayurveda the term Purush is termed for living body comprised of five Mahabhootas, the five basic elements i.e. Prithvi, Aap, Tej, Vayu and Akash along with soul or Atma including Satva and Indriyas without which it is called dead body. The combination of five Mahabhootas and soul is known as Purush or Chikisya Purush. As per Ayurvedic definition Sharir is combination of three factors as Charak says An- other definition is an object which have continues decay process. The term Sharir means ‘in Sharir’ or ‘related to Sharir’ or 'from the Sharir thus Sharir Kriya deals with functions of Sharir or inside or outside of the body. The ancient writers of Ayurved, the Rishis. Charak, Sushrut etc. summarized the total subjectivity at the end of each chapter so that the student may recollect the subject studied so far. The author has followed the same pattern in her present book. Also in the beginning of a chapter the total subjectivity of the chapter is given in two-three lines in a box so the student will know the introduction about the subject which is to be studied in detail in that chapter. 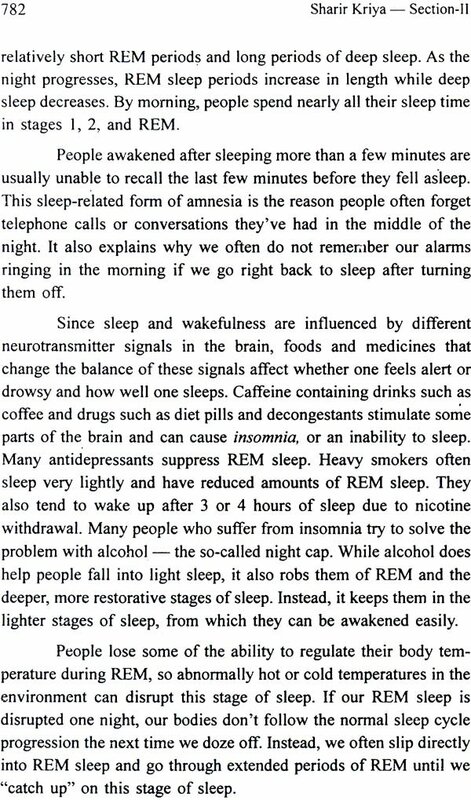 I think that very few present authors follow this ancient system. Many Sanskrit words and sentences are described and analyzed as per Sanskrit grammar so the student will understand Sanskrit, the original language of ayurvedic Samhitas, easily which the student is going to study. The Book is written in simple English and with a new technique. So the students will grasp the subject easily. I congratulate the author for her valuable work and hope that she will give more such nice books to the ayurvedic fraternity. Sharirkriya (or dosh dhatu malal vidnyan as previously called) is a very important subject for the 1st BAMS students, because it deals with the ayurvedic physiology. Which is different from the modem physiology & is the foundation of ayurvedic diagnosis & ayurvedic treatment. It is a great pleasure & a valuable stimulation for 1st BAMS students that the work of basic importance becomes available in English. Sharirkriya is a study of various functions, which take place in the living body. Ayurved is not only a medical science, it is a science of life & hence differs principally & fundamentally from modern medical science. Sharirkriya is study of three doshas & saptadhatus mainly. 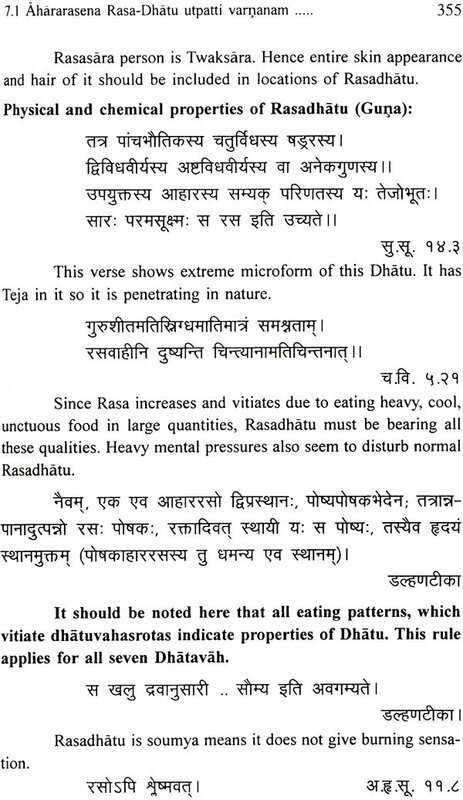 The body is composed of dhatus & the tridoshas take shelter in them. The concept of soul or at man is speciality of Ayurved. From zygote formation till death soul stays tuned with the body. Living body is an instrument for soul to enjoy earthly style of life. When the soul departs, the body becomes vacant & only the five maha bhutas remain. Ayurved is person centered & modern modern medical science is disease centred. This is the main difference in both the sciences. The book is written keeping in mind that the students in India knowing Devanagari script are learning the subject. The author has rightly pointed out in the chapter on Introduction that “Science of Ayurved is more observe then investigated & is based on clinical findings ”. Student of SharirKriya must remember this. The author has compiled many references from the compendias as well as the commenteries on the same. Beginning of every chapter is with the learning objectives in seperate text box & at the end of the chapter. She has given a list of questions for self studies, thus is beneficial for a beginner. Additional comments at the end of the chapter will also be useful to the post-graduate students. The meaning of each & every word occuring in the 'sutra' is given & also explained, so that the students who do not know anything about ayurved upto the 12th std. & coming especially from the English medium schools will understand the science of Ayurved. The author D. Nandini Dhargalkar Ph.D. (Ay.) is a Prof. of Sharirkriya at the Tilak Ayurved Mahavidyalaya, Pune. Even after attaining the highest degree in Ayurved, she utilises every minute of her sparetime in pursuing her studies in Ayurved most diligently. In this book the author has dealt with the entire literature on Dosha, Dhatu, Malas as given in Ayurved in a masterly manner. This book is so comprehensive that there is no need in future to refer to any otherbook on Sharirkriya Vidnyan. This book is useful to under graduate students & post graduate students alive. Sarir-Kriya or Kriya-Sarir is a conjugated term. ln simple language, meaning of the word 'Sarir' is 'body' and meaning of the word 'Kriya' is 'function'. Therefore Sarir-Kriya is a study of various functions, which take place in the living body. These functions are postulated as per Ayurveda science' This subject Sarir-Kriya, was previously titled as 'Dosa-Dhatu-Mala-Vidnana'. The student learns Physics, Chemistry, Biology and Mathematics up to Twelfth standard. He cannot grasp the language of Ayurveda, which is ancient and heavy. Available textual material of this science is in the form of compendia. 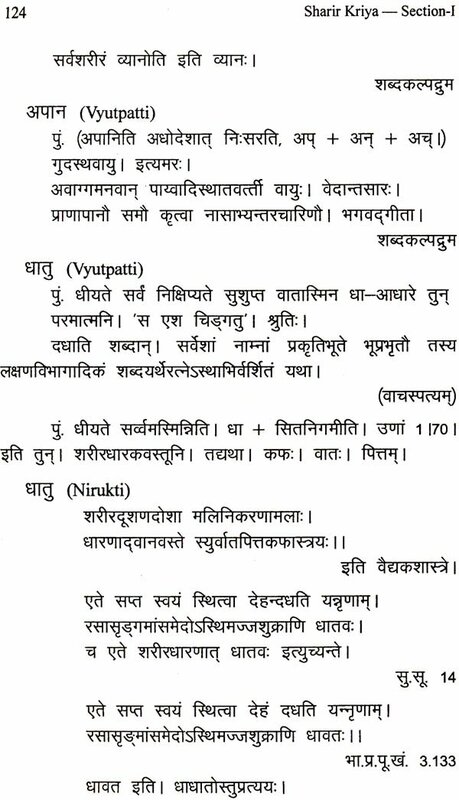 These compendia are written in Sanskrt language. A major percentage of students taking admission to the course of Ayurveda are from Convent or English medium instruction schools or from schools of regional language. They may or may not learn Sanskrt language in their schools. It therefore is necessary to avail a book of Sarir-Kriya in English language for first year students taking admission to B.A.M.S. course. This book furnishes Sarir-Kriya-Vindnana in simplest possible way in easy English language covering the entire syllabus by CCIM. Not only unergraduate but post-graduate students will also benefit, as a lot of references are added into the book for the sake of satisfying today's enthusiastic student. Another important aspect for the need of such book is enlightened below in the discussion about syllabus and exam pattern of this subject for the first year students of B.A.M.S. course approved by CCIM. As per the aim and objects of CCIM, Ayurveda graduate is supposed to have profound scholarship in deep basis of Ayurveda with scientific knowledge in accordance with fundamentals of Ayurveda with extensive practical training. Any reference book on Ayurveda meant for this course should be able to accomplish the aim for maintaining the quality. Entire original knowledge of this science is accumulated in the compendia. However, the division of chapters in the compendia or Samhita was not allocated to accomplish the present C.C.I.M. syllabus. The composition of the compendia was shaped in old style. Ayurveda basically is an eightfold science, comprising eight divisions and therefore is called Astang-Ayurveda. 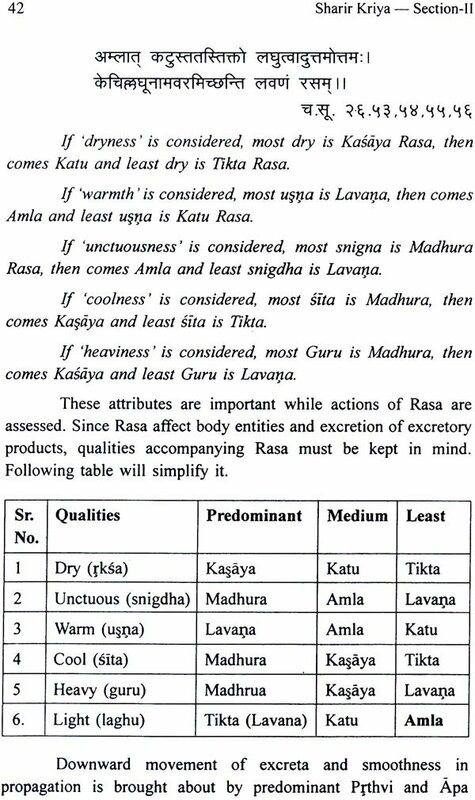 Sarir-Kriya could not be one out of these eight categories, when these compendia were composed. The various references regarding the present curriculum of this subject are scattered throughout the compendia. It therefore becomes inevitable for the scholar of Sarir-Kriya to find and compile the references related to the subject of Sarir-kriya. The syllabus in this subject as per CCIM is given in a separate chapter following this chapter. This syllabus to certain extent is built on the modem medical ground. There is no separate division in the original compendia by the title Sarir-Kriya. 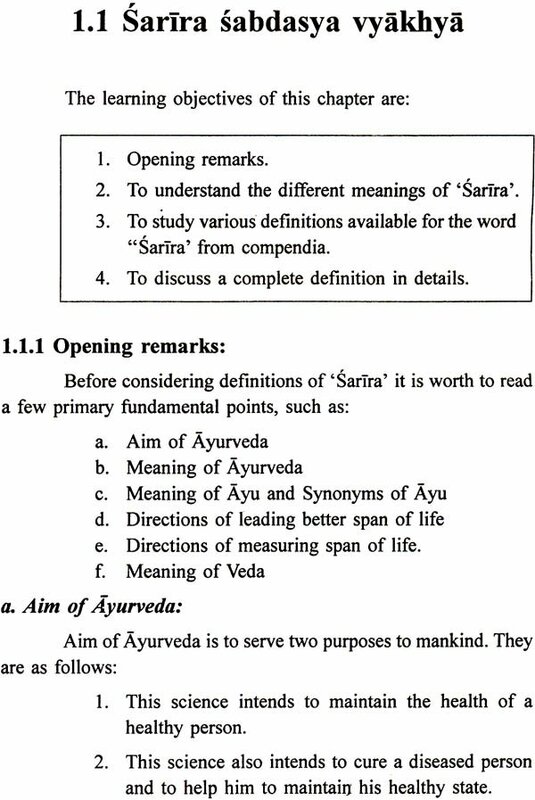 One of the sections in each compendium is 'Sarir-sthana. This section in the Ayurveda compendia is neither a collection of pure anatomical view nor a collection of pure physiological view This fact calls for the appropriate reference book for this subject this subject. The student appears for the final examination First BAM.S. course after three terms or 1.5 year. The examination of this subject is in both, theory and practical. The minimum pass marks are 50 percent in theory and 50 percent in practical separately. There are two papers covering the syllabus worth 100 marks for each paper means theory examination of 200 marks. 1. The aim of writing this book is to compile and explain important references from Ayurveda compendia in context to Sarira-Kriya. 2. The complete syllabus estimated by CCIM is covered, word-to-word in this book. 3. 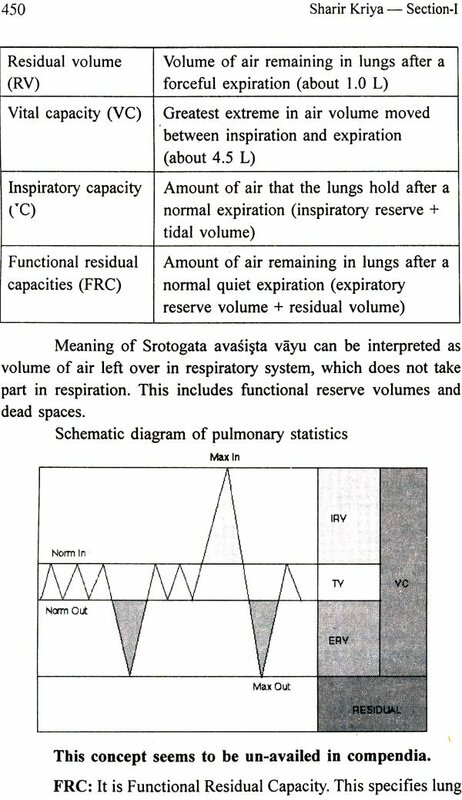 While wrapping CCIM syllabus, parallel fundamental principles from medical physiology are supplemented wherever applicable. 4. Clinical view is complemented for the sake of better understanding of the topic, when and wherever necessary. 5. Latest researches are noticed and added wherever the need calls for. Additional comments are provided at the end of chapters wherever detailed knowledge for post-graduate student is expected. 6. Learning objective of each chapter are given in the beginning of the chapter in separate text box. This can facilitate the reader to choose his own area of interest in a very short time. 7. Opening and concluding remarks are read in many chapters to keep the fluency between the curricular points. Additional points for the sake of detailed study are given at end of chapter after 'Questions for studies'. Those who are interested in deep studies should read them. 8. English meanings of Sanskrt verses from compendia are provided in italic letters below the verses. 9. Important statements are highlighted in bold italic letters in the brackets. 10. Questions for self-studies are given at the end of each chapter. 5. 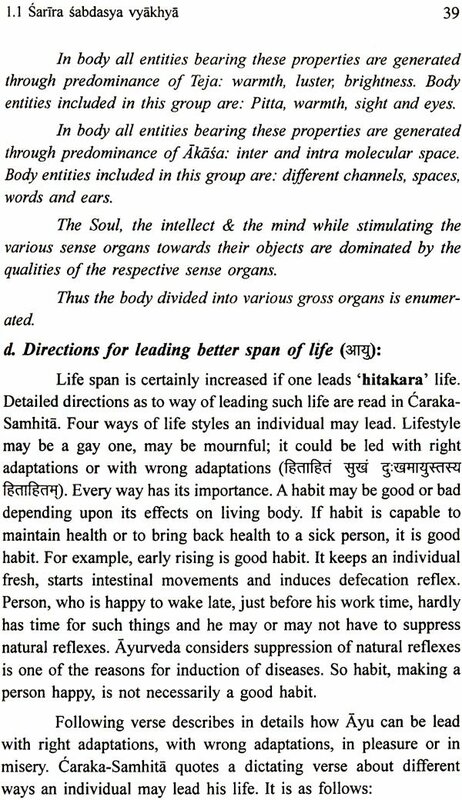 Difference between Physiology of human being, in Medical science and in Ayurveda. Medical sciences, Modem as well as Ayurveda, serve health related purposes to the mankind. They are based on different principles. Modem medical science and modem physiology got expanded with upgradations and improvements in principles of physics, chemistry, biochemistry etc. After electron microscope, advancement in the cell physiology was remarkable. 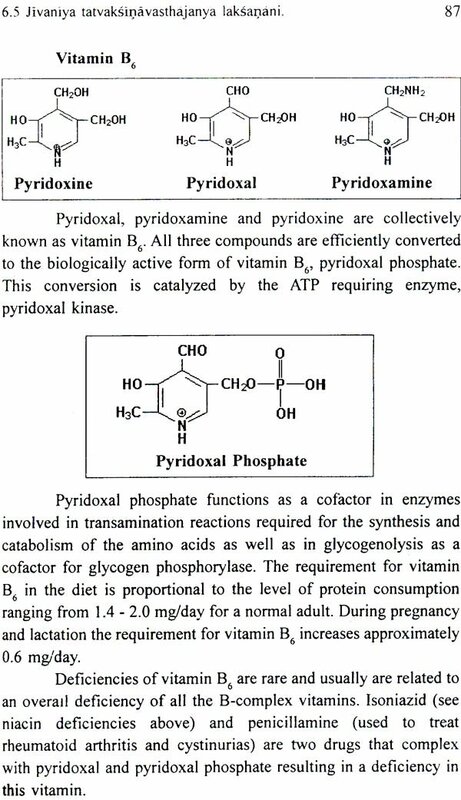 This led to an expansion of modem physiology on molecular basis. Major breakthrough was observed when biochemistry of nuclear material was understood. This made genetic science to reach genetic engineering. As opposed to this background, Ayurveda was supposed to descend from Lord Brahma, Human designed written version of this science. It is inevitable to think that version available today is edited by human. This version is based on very ancient sciences like Yoga, Nyaya-Vaiserika and such other sciences. These sciences had, their existence in the era of veda, upanirada etc. Ayurveda learner today may or may not be aware of these ancient sciences. For this reason it becomes difficult to grasp fundamentals and language of Ayurveda for new learner. 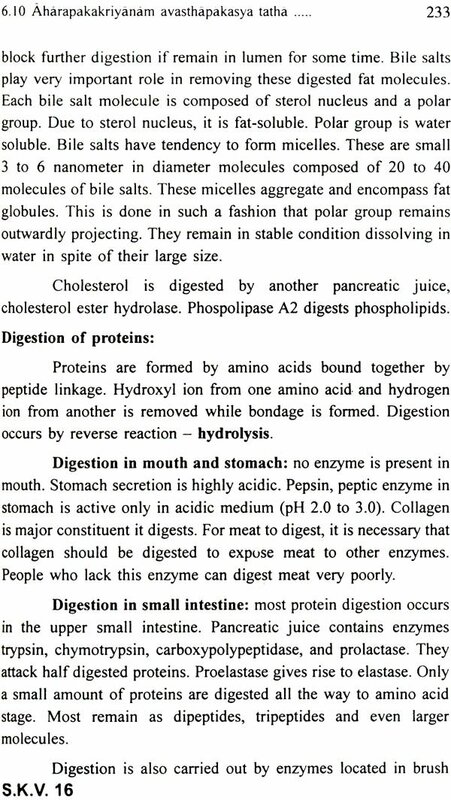 Without understanding principles of these said sciences, to study only Ayurveda fundamentals is futile. Ayurveda we read today is human created version of the same original god-given one, which is based on surveillance of cosmos. Ancient human observed various governing rules of ongoing universe. He happened to scrutinize the effects of environmental changes on living beings, plants, living creatures, animals etc. This science claims that human being is part and parcel of the nature around. Consequently rules of universe have to be applicable to humans by default. Both, Ayurveda and Modem medical sciences serve purpose of 'health maintenance and cure and prevention from the diseases'. Yet they are principally and fundamentally apart from each other. There are a few places, where parallels are found, which are mentioned in this book. However, principles of Ayurveda are studied as they are. 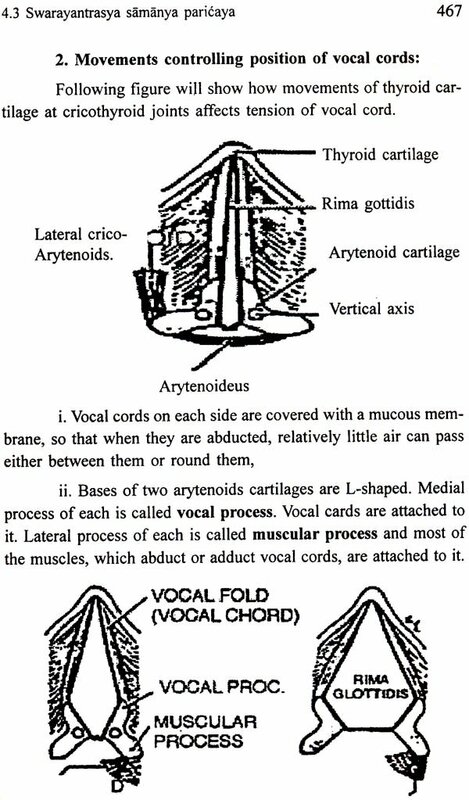 For every aspect in physiological technique of Aurveda, modem explanation is not feasible. This is because of huge time passage between these two sciences. Ayurveda evidently is an ancient science as compared to Modem Physiology. Science of Ayurveda is more observed than investigated and it is based on clinical findings. Modem physiological study starts with cell. A group of cells doing same function is called tissue. A group of tissues doing same function is called a system. Modem physiology is study of functions of various systems. Ayurveda physiology is study of three major biological gears of living body, namely Dosa, Dhatu and Mala. They together constitute living body. Each group has its own characteristics and has different role in the homeostasis of the body physiology as well as in the origination of diseases. Modem physiology is a believer of statistics. Physiological values are given as an 'average' of thousands of readings. Ayurveda comparatively is an individual specific science and does not forward parameters in statistical way. Advent of sciences like physics, chemistry etc. a outcomes of new research projects always change hypothetical concepts of modem physiology. There are no hypothetical concepts in Ayurveda. The fundamentals and basic principles are evidence-based and therefore unchangeable. They are proposed only after clinical as well as practical experience. Centuries are passed but Ayurveda principles are still taking fresh breaths. Many such differences and similarities are mentioned in the text of forthcoming chapters of this reference book. Ayurveda has sustained its breaths for centuries together. It is worth to note basic functions of living human body specified in Ayurveda science before learning further divisions in details.